Pests make a residential rental property look poor and can cause major physical damage to property. 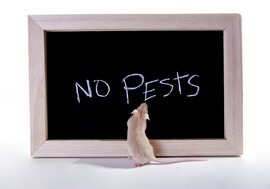 Besides that, tenants can have health problems due to pests. Property managers and landlords can take precautionary steps to prevent pests from entering the property and becoming a problem. By involving tenants in preventing pests, property managers and landlords can avoid wasting time and money on treatments and repairs for pest infestations. By dealing quickly with pest infestations property managers and landlords send a strong message to tenants which results in tenant having high satisfaction with the residential rental property resulting in lower turnover. 1. Starve them out: Make sure that food is not easily accessible or left out. Keep a tight light on trash and empty it often. 2. Dry them out: Make sure that leaky pipes, faucets, etc are fixed immediately and water spills are cleaned immediately. 3. Keep them out: Pests like rodents and roaches love cracks and can squeeze out of anywhere. Seal all openings and cracks around pipes, windows, sinks, etc.